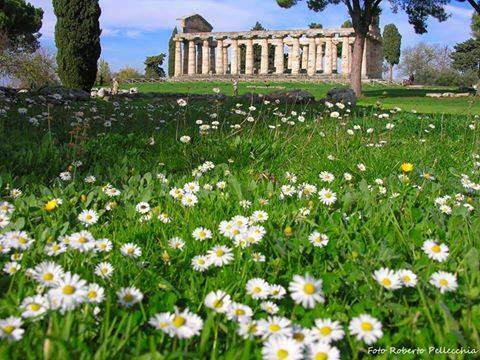 The region of Campania has been known as a paradise on earth since ancient times. The Greeks built some of their most impressive temples here and under the Romans it became known as ‘Campania Felix’, or the Happy Land. When travelling through this region, one becomes overwhelmed by its wealth of cultural and natural attractions, from the great city of Naples to the well-known Costiera Amalfitana, with its towering cliffs and picturesque coves. But Campania’s real secret is located south of Salerno. Here the coastline bulges out into an expanse of mountainous landmass known as the Cilento, now one of Italy’s biggest National Parks, with World Heritage listing. This is an area of amazing natural beauty, where crystal-clear water laps at uncontaminated rocky coasts, and wild untamed forests cover high mountain peaks. This tour follows roughly the traces of a new cycling route, the ‘Via Silente’, a journey of 600 km. through the Cilento National Park, a magical, authentic, sometimes harsh, sometimes stunningly beautiful area. The route is named after the typical ‘sound’ of the places you will discover: ‘Silence’. Cycling through the Cilento you’ll experience the real sound of silence, which will completely neutralize the day-to-day noise you are probably used to. The original route describes a circle, touching both the shores and mountains of the Cilento National Park, and is divided in 13 stages, with two optional challenging stages to climb Mount Cervati (1899 m.) and Monte Gelbison (1705 m.). At Genius Loci Travel we have developed two tours which roughly follow the ‘Silent Way’, but taking out the least interesting and too challenging parts, while putting in some extra’s, and making you stay in the best possible, most authentic, and most welcoming accomodations, to make you really go ‘under the skin’ of the real Cilento. We have called this route the ‘Via Cilento‘. The first part of the route is very picturesque. 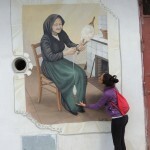 It passes through the quaint fishing villages of Pioppi and Acciaroli. From there, it continues for 40 Km following the beautiful coastal line. From this point on, it will take 400 km. to have the sea in front of you again. Meanwhile, you will have travelled through an amazing piece of Earth. You will have touched the clear water of Calore river and will have enjoyed the primitive charm of the caves of Castelcivita and Pertosa, rich in stalactites and stalagmites. Plains, beech woods, valleys dotted with orchids, charming rural hamlets, and much more. Your time on the Silent Way will be magical, but not without difficulty. In fact, The Silent Way goes sometimes through a very harsh land, wild, and for that reason authentic. We are sure that during this tour you will learn to know and love the Cilento area, discovering its many natural and cultural treasures. Even more so you will be pleasantly surprised by the hospitality of its people, who will make you feel like a welcomed guest. Please note: this is a moderate tour which is suitable for all those who have some experience of bicycle touring and are in a good general physical condition. On some of the inland stretches you may encounter some steeper climbs (vehicle support possible). Two of the steepest climbs can be booked as an optional extra. Average cycling times: approx. 3-5 hours each day. After your arrival at Casalvelino you will be picked up from the train station and brought to your first accommodation. Your bike will be waiting for you here. In case you are early want to try it out already you could go for a short ride to the Greek city of Velia or ride down to the beach for a quick dip before turning in and getting settled in at the hotel. In the late afternoon you will be welcomed by your local host and receive your ‘Silentina’ as well as the full information package. You will have a first great meal based on local specialties at the premises of your hotel or agriturismo. Your journey begins in the plain of the Alento River, a nice way to warm up a bit, before tackling the first, easy hills along the coastal route to Pioppi, a wonderful small village with an ancient castle that today hosts the Museum of the ‘Mediterranean Diet’. In alternative you can follow the ‘original Via Silente’ and tackle some more serious hills, heading for Acquavella and continuing in the direction of Stella Cilento, on the slopes of Mount Stella. From Stella Cilento, continuing on SP77 for 3 km, you will arrive in Omignano. 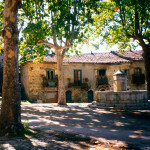 There, in the main square of the village you can visit the “laboratory” of the artisan basket maker Giuseppe Giuliano. The Silent Way continues in the direction of Galdo. Take a rest at the Caffe’ Letterario (the literary cafe). In this place “thoughts shape themselves”, do not miss it. You then pass through the charming hamlets of Celso and Pollica, with great views over the sea. This first stage finishes in beautiful Canicchio, on the slopes of the Monte Stella. 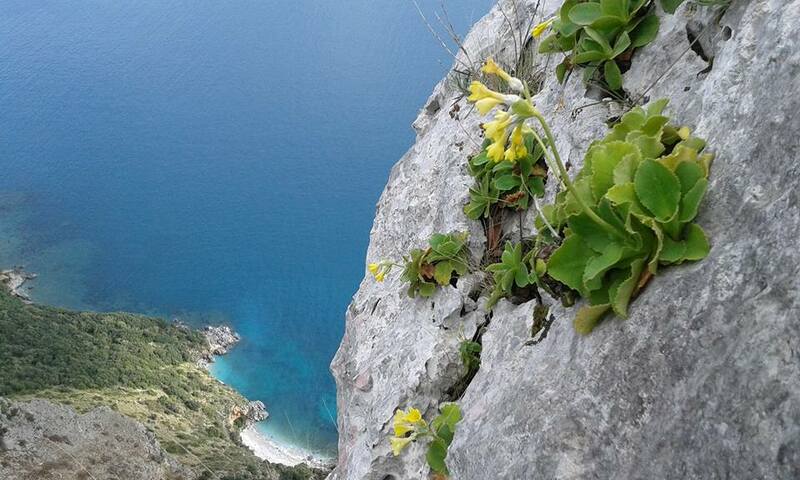 Its view on the Mediterranean Sea, just on above Acciaroli is priceless. Today you will reach the sea very soon. You will be able to reach it at dawn, when fishermen will be coming back from the catch of the night. The road is downhill, full of turns for 8 km, and passes through typical Olive plants. Once you are on RS267 you will have in the village of Pioppi behind you. If you want, it only takes 2 minutes to reach it so that you can stop and drink a coffee on the square before beginning your journey again towards Acciaroli, a quaint little fishing village, loved by Hemingway. More recently, it has becoming a beloved summer resort. From here, without leaving the coastline for a second, you will reach Agnone and Ogliastro Marina. You are now very close to Punta Licosa and its little island that carries the same name. Between Ogliastro Marina and the following village Pozzillo, in a piece of 8 km, you will cycle in the middle of a pine tree forest, a Pinus halepensis reserve, among the oldest and better preserved of the entire area of the Cilento National Park. 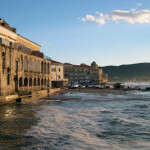 Immediately after the village of San Marco, you leave the coast once again to begin the exploration of Cilento’s heart. Here, you will face the first significant slope of The Silent Way. This slope, will allow you to reach the village of Castellabate. Visiting Castellabate is truly worth it, especially its ancient castle whose building begun on October 10th, 1123. 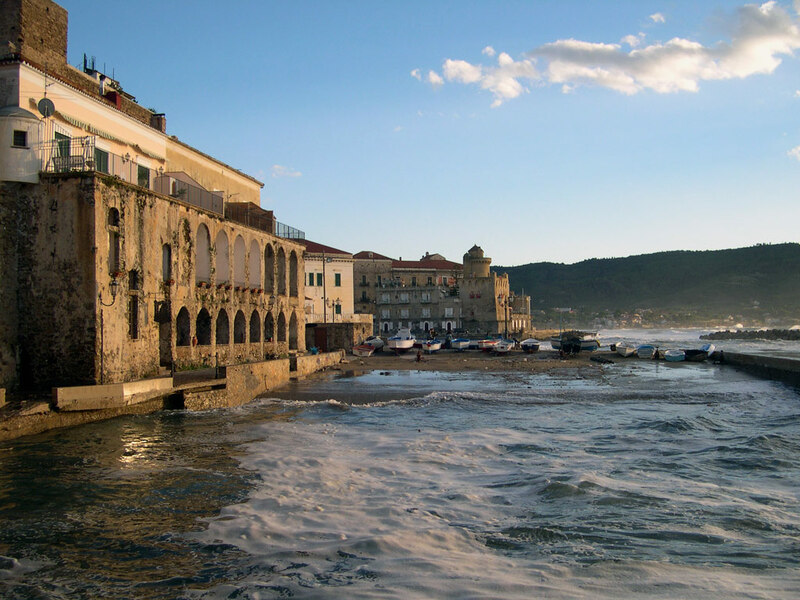 After Castellabate, you will climb to Perdifumo, then Mercato Cilento and finally Vatolla. Make sure that you visit Palazzo De Vargas here. The place hosts the museum dedicated to Gianbattista Vico (an Italian political philosopher, rhetorician, historian, and jurist). Still oday it is possible to sit in the shadow of the Vico’s olive tree, in the square of the Convento della Pieta’. It is exactly in this place, in the absolute surrounding peace, that Vico set in place his theory of the Science of History. 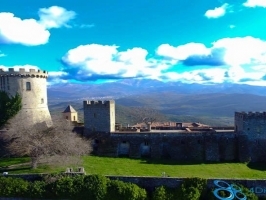 From Vatolla, the third stage proceeds to Mercato Cilento; from here, by a long dirt road that starts from the Convento del Carmine, you get to Rocca Cilento, dominated by the Angevin-Aragon fortress. Then you go down to Torchiara, beautiful center located on a scenic ridge. Continue on SS18 until, before reaching Ogliastro Cilento, a small road on the right will lead you to the village of Finocchito, then in Monte Cicerale, and finally Cicerale. Mercato Cilento in the Middle Ages was the point of convergence of the main roads have the territory of Monte Stella and became a place of trade following the construction of a church in the fifteenth century, probably built in 1472 by the Carmelites along with their convent, leaning against the side church. The dirt road uphill to the side of the convent of Mount Carmel is the first part of an interesting path that follows the ridge, with views of both inward land and toward the sea. The road skirts the thick woods of the Forest of San Francesco and finally reaches in view of the spectacular castle of Rocca Cilento. The first information on this site can be found in a manuscript of the year 1110. There, the decision of William Sanseverino to move the seat of the Barony of Cilento from the fortress on the top of Mount Stella to Rocca Cilento, is described. The castle is one of the most characteristic monuments in the landscape of Cilento, set atop a hill at 635 m above sea level. Leaving Rocca Cilento on the road you will pass by the old Convent of San Francesco, founded in 1417 by St. Bernard of Siena with the help of some noble families of the place. Past Torchiara, the Silent Way continue for 3.5 km on SS18, until a panoramic road on the right takes you to the tiny village of Finocchito. Stop and rest on the square outside the church, where silence reigns. After Finocchito, continue in the direction of Cicerale, named after the Latin expression Terra quae cicera alit, meaning “land that feeds the chickpeas.” Now you cycle above one of the largest reservoir of the entire territory of Cilento and Vallo di Diano: the Alento Lake. Around the dam, the ‘Oasis’ now is a ideal place for birdwatchers. After Cicerale, you will continue towards the village of Trentinara (606m. ), clinged to a rocky mountain that looks down on the valley of the Sele river. From the panoramic square at the top of the village, you can clearly see the Costiera Amalfitana (Amalfi coast) and Punta Licosa. From Trentinara to the village of Monteforte and then to Magliano, the road goes gently uphill. 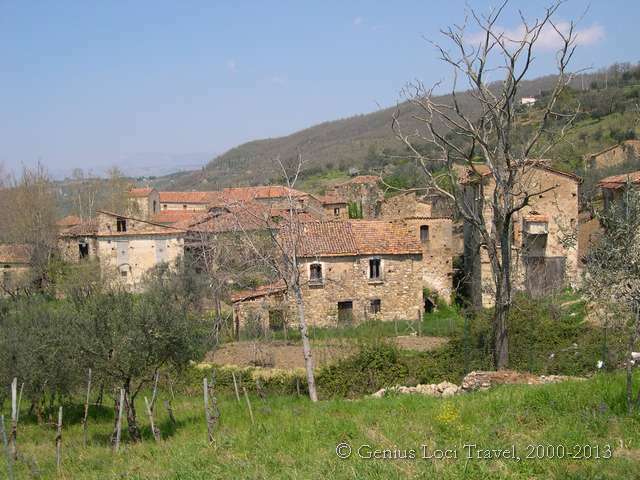 Your next stop will be the village of Stio, where you will be staying in a beautiful, welcoming B&B. Take some time to visit Stio and pay a visit to the lute maker’s Museum Trotta as well as the – completely unexpected – modern art museum. Leaving Stio, you will go down on a dirt road that will lead you on the embankment of the Calore’s river. From here, you will reach the medieval bridge of Magliano. Felitto is very close now. Felitto is famous for the Calore ‘Canyon’, a hiker’s paradise, and its special “fusilli felittesi”, a typical pasta. From now on you will continue along the Calore river. After a few km from the Gole di Felitto you go past Castel San Lorenzo and Roccadaspide (where you will find the Filomarino Castle). Ahead of you, you will see the massive of the Alburni mountains. At its slopes there is Castelcivita with its very famous caves. The caves are on the right side of the Calore river, half way between Castelcivita and Controne. The Silent Way does not touch Castelcivita, however if you have legs and lungs just go, it is worth the ride. From Controne, well known for its special beans, following the road signs for the cemetery, a secondary road goes up on the Alburni mountains until Postiglione presenting you its well-maintained medieval castle. The road is very steep for 1 km, then it becomes more shallow.On your right, the imposing presence of the Alburni Mountains will guide you. After Postiglione, a secondary road goes just past the cemetery and leads after a few kilometers back to the main road. At the intersection of Scorzo continue in the direction of Sicignano degli Alburni. From here and all the way up to Petina the view on the right is dominated by the mighty and magnificent buttresses of Alburni. Entering Sicignano, you will notice its ancient castle recently restored and spectacularly situated on a relief to guard the valley below. You will stay again in a great agriturismo. Today is a short stage, but with a serious climb! From Sicignano you continue along the beautiful road in the shadow of the Alburni Mountains, until you reach Petina, set on a small plateau at the fee of the Alburni. Here you can gather the energy to tackle one of the steepest climbs of the whole tour. From Petina you begin a notable climb through the dense chestnut forest, gradually turning into thick beech forests. At the end of the climb you will find yourself on a wide mountain meadow at about 1100 meters above sea level: here stands the Observatory, an evocative and isolated building, made surreal by the characteristic metallic dome which houses the scientific instruments (vehicle assistance up to this point is possible). From here the road is gently rolling. After a few kilometres you arrive at the small path which leads to one of the symbols of the National Park, the Antece, a prehistoric rock sculpture, which could very well be an ancient representation of a God or a hero. Its date is placed between the year 1000 and 400 before Christ. To get to the Antece you will need to leave your bike and continue walking. From up there, where the Antece stays since millennia, the view will leave you speechless. 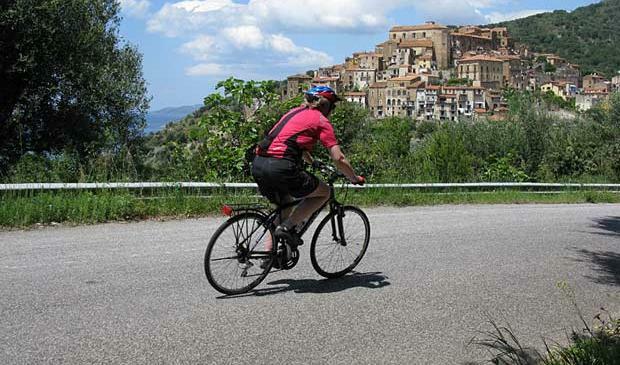 Once you are back on your bike, it will all be downhill towards Sant’Angelo a Fasanella. In the period between June and July, you will also benefit from the typical yellow color of the flowered Broom. Once in Sant’Angelo a Fasanella you will be able to visit one of the marvels of the Cilento, the Cave of San Michele Arcangelo, UNESCO Heritage, just like the Antece. Continuing the Silent Way you will pass Corleto Monforte and from there it’s only 10 more km. to Roscigno. Hopefully you will reach Roscigno in time to enjoy the sunset from the view of the famous abandoned village. The small village was subjected to catastrophic seismic events in the XVII and XVIII. It was definitely abandoned between 1902 and 1908. From that point, time stood still in Roscigno. 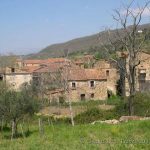 You’ll sleep in a nice bed&breakfast in the new town of Roscigno or in a beautiful agriturismo, Villa Vea, near Bellosguardo, just north of Roscigno. Today you will technically leave Cilento, and you will enter Vallo di Diano through the Sella del Corticato. From Roscigno, go towards the village of Sacco. After 3 km you will go through one of the tallest single-span bridge in Europe. Below you, after 170m you will see the Sammaro River. Past the bridge, you will find the indication of the path that will bring you to the river’s source. The path is 1km, it is very steep. Climbing back again will be very challenging. From the village of Sacco, you will start climbing towards the beautiful Corticato Pass, the highest point of the Silent Way (1022 m.). The effort will be worth it. Between Mt. Motola and the Cocuzzo delle Puglie mountain during spring you will find a completely yellow landscape. The broom flower gives it its typical colour. Once at the top of the Sella del Corticato, looking down you will see the village of Teggiano that you can reach with a refreshing down-hill path. The population of Lucani founded Teggiano during the IV century b.c. It is also called “the village of churches”, due to the numerous religious places you will find here. The first church if the one dedicated to SS Annunziata (XV century). The road will lead you to the main square of Teggiano where you can find the church dedicated to S. Francis, 1307. In the very same square, with a lateral entrance, you will also find the Cathedral dedicated to S. Maria Maggiore, 1275. Further in Teggiano, you can find the church dedicated to S. Peter (XIII century), the church dedicated to S. Angelo (XII century). On the opposite side of the village, north side, you will find the church dedicated to the Pieta’. Teggiano, also hosts a very important museum that collects spices. It is the focal point for researches from all over the world and the local farmers. The 8th stage will bring you back into to the Cilento National Park, through the Certosa di San Lorenzo, also known as Certosa di Padula, the largest carthusian monastery in Italy. From Teggiano to the Certosa it is quick. However, for some kilometres the way will be less silent than usual, with some busier roads. Before reaching the Certosa, you shall certainly visit the unique Battistero of S.Giovanni in Fonte. There is a water fount in the middle of the church and its water is used for baptisms. This is one of the world’s most antique Christian settlements, founded in IV during Constantine era by Pope Marcello I. Just outside the ancient village of Padula you will find the Certosa, founded in 1306 by Tommaso Sanseverino. Its construction was very slow, it lasted until 1850. Carlo V was hosted here after the battle of Tunisi in the year 1535. Since 1997 it is rightfully part of UNESCO. The access is through a rectangular courtyard with the monumental eighteenth-century façade as background, the original entrance to the monastery. Before entering, to the side of the corridor, a door leads to a very elegant spiral staircase connecting the library, paved with tiles and paintings of the eighteenth century. The large cloister dates back to 1690 and is the largest in Europe with its 15,000 square meters, with an arcade of 84 arches of ashlar pillars. From the large yard you will see the village of Padula, that here appears almost suspended on the roofs of the Certosa. If you have the strength to get back to the top, we recommend a visit to Padula’s historic town center with the Church of St. Michael the Archangel which rises above the houses and the monastery and the Church of St. Augustine, built to the fourteenth century. In the old town, it is also remarkable the House-Museum of Joe Petrosino, dedicated to the famous Italian-American police officer, with documents and objects belonging or linked to his figure. Then ride through the plain to the next village, Buonabitacolo, know for the Festa della Cuccia, a soup of legumes and cereals. Ask for a bowl of Cuccia, it will give you enough energy to tackle the last bit through a pretty landscape of rolling hills and to finally reach Sanza, your final destination for today. Today you will have to make a choice. You can take it easy and continue the Silent Way towards Morigerati and Casaletto Spartano, through a rolling landscape. Alternatively, you can climb on the Cervati mountain up to 1898 m. above sea level, the highest mountain of the region. The Cervati mountain is spectacular, however you will face 24 km of climb (7 km on asphalt road, and 17 km on dirt road). During the last stretch, you will even have to push your bike for a bit, or just leave it and enjoy the walk. For this reason, it is advised to leave the bags in the structure that hosted on the previous evening and just bring a small bag with some food and water with you. At 1100 m. in the village Colle del Pero, you will find a sign pointing you towards Affondatore di Vallivona. In about 10 minutes you will reach the entrance of a tunnel, it is roughly 400 meters long. Be sure you have proper anti-slip shoes and a flashlight, the tunnel is completely dark. Leave your bike before the tunnel, and secure it with a chain and a lock. At the end of the tunnel you will find something unique, it will seem like you have travelled in time. You will enter into a cave with a unique microclimate that allows prehistoric plants to still leave and prosper, the Farfaracchio. From there, walk back outside of the tunnel and continue your journey towards the top of the Cervati mountain and the Church of the Snow Mary. Nature here is at its best. Here, only the Broom tree survives. All around you will only have calcareous rock and silence. It is exactly here that you will finally understand the reason that lead you to the Silent Way in the first place. The stage of today will bring you back to the seaside. The Silent Way is still quite demanding, going up and down continuously. After 15 km from Sanza you will find Caselle in Pittari. During the month of July, here you can attend a very characteristic event: the “Palio del Grano”. Eight districts of the village will challenge each other in a very ancient activity: hand harvesting of wheat. After Caselle in Pittari you go south along the SS517 until the crossing of the SP210 that will lead you to the village called Sicili’. One km. after Sicili’, the Silent Way goes above the Bussento river. Rest here for a while to enjoy the sound of water and vegetation all around. Get some energy before climbing towards Morigerati. Here you will find the church of Saint Demetrio, with access to it from the arch of Castello Baronale. The view from the church is astonishing. In Morigerati you must visit the WWF oasis named Grotte del Bussento. Within the oasis you will also find a water fount that comes out in the proximity of the old wind mill. Still in Morigerati don’t miss the “Etno-graphic” museum silvo-pastorale. You will leave Morigerati from the north side going along the road until the SP16, taking a right turn towards Casaletto Spartano. Just outside Casaletto you cycle along one of the area’s most beautiful natural wonders, the so-called ‘Venus Hair’ waterfall, in the small river Rio Casaletto. At the end of the day, Casaletto and Battaglia may host you in one of the most silent nights of the Silent Way. At the end of the 11th stage, you will have the sea again in front of you. From Casaletto Spartano you shall follow the road to Tortorella. At the roundabout, take the narrow road that goes down on the right. This path is mostly downhill and it crosses woods until another crossroad. There, on the right, following the direction for Villammare, there is another narrow road downhill. The latter, after 2km will lead you on the SP210 road. Go ahead towards south for roughly 600 m. At that point, you will find another crossroad. You may go to the sea, finally through the village of Vibonati. The Silent Way, however, will lead you to the right, following the sign for Santa Marina. The way goes down towards Policastro Bussentino. There, you will pass by the former cathedral dedicated to the holy Mary. In Policastro Bussentino there still are the remaining of the walls of an ancient Byzantine city. Passing under the railway, you can continue towards Scario. This old angler’s village is characteristic for its port with the church. Go visit it and rest before continuing with the Silent Way. The next 7 km will all be climbing until the village of Bosco. Jose’ Ortega, the pupil of Pablo Picasso, lived here for twenty years of his life. He painted 196 majolica at the entrance of the village. The museum with its masterpieces is always open between June 15th and September 15th. During the rest of the year, reservation is mandatory. After leaving Bosco you go back to the crossroads that lead you there. You take the right continuing on the SS562 until you reach the village of San Giovanni a Piro. There, the sanctuary of the Pietrasanta is really worth visiting. It is built on a steep rock, by monks in the 13th century. If you want to stay some more time here, from San Giovanni a Piro there is a road that will take you towards the top of the Bulgheria mountain (1215 MASL). If you don’t have an extra day, you must in any case take a moment to admire the Policastro Gulf from the view of Ciolandrea, one of the most stunning panoramic terraces of the whole of southern Italy. From here, when the sky is clear, you can even see the island of Stromboli, part of the Eolie islands of Sicily. This is the 12th stage on The Silent Way, an easy, but beautiful route. Today you will touch two of the most beautiful costal places of the entire Italian coast. The first is Marina di Camerota that was awarded as the most beautiful beach in Italy in 2013 and 2014. The second is Palinuro, with its wonderful caves, the natural arc and its long beaches of fine sand. During the summer period, Palinuro and Marina di Camerota are extremely lively due to the convergence here of young people from all over Italy. Despite the many activities here during summer, what truly leaves you speechless is mother nature. Go and visit Baia degli Infreschi for instance. You can reach it by boat or walking through the typical woods “Macchia Mediterranea”. Here water is crystalline with silence all around that would make you want to stay. Those rocks all around, are the house for the Primula Palinuri flower. 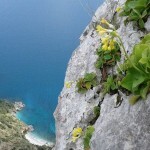 It is a protected species and it is the symbol of the Cilento National Park. Palinuro was initially angler’s village. Today, instead, it represents the perfect destination for hundreds of people during summer. Today The Silent Way is rather easy. The first 13 km of the 13th stage will be on the seaside before going back to the heart of Cilento towards Ceraso. Along your way, you’ll meet the lovely Pisciotta, located along the hillside, on a hill dominated by the great Marquis Palace. It is worth stopping at one of its squares have a drink or stock up on fruit stalls along the way, before taking the way that will bring you back to the inside of the Park. The first village that you will meet will be Rodio. Leave Rodio on a challenging climb top of the hill near a crossroads; here we turn left in the direction of Catona. After Catona, continue towards Terradura but before reaching the village, the Silent Way turns right and heads towards the village of Santa Barbara. Santa Barbara was built around a church in the year 977. It is attributed to the Greek monks, perhaps fleeing Velia to escape malaria and fear of pirate attacks. The oldest part of Ceraso is the district ‘mpieri Ceraso’ (at the foot of Ceraso) where the Church of St. Nicholas of Bari is also located. Other buildings of historical importance are the buildings ” Lancillotti” and “Di Lorenzo”. After the top of Cervati mountain, Gelbison is the highest peak of the Silent Way (1705 MASL). After 10km from the beginning of this stage, you will slowly start to climb already. Precisely, Novi Velia will represent the turning point. Novi Velia is characteristic for its Norman tower. Once you are at the entrance of the village, at the roundabout follow the direction Via Monte Gelbison until you will find a sign that indicates the ancient pilgrim’s road. From this point, climbing will get harder. At each turn, you will hope it is finished. Due to the steep difference in height, the vegetation changes suddenly. Between 600 and 800 meters, the Quercus dominates the landscape, then chestnut tree, and spruce tree. Finally, after a section that is completely straight, you will reach the “Cross of Rofrano”. If you managed to get here without getting off your bike and push it, now it is the time to actually get off your bike. The sanctuary is only few meters away, and the last part of the road is an ancient sacred path made of a special stone. Indeed this sanctuary is created on an ancient place where pre-italic populations used to go and meditate. The name Gelbison originates from Gebel-el-son and in Arabic means the Mount of the Idol. The name has to be attributed to Muslim pirates of IX century. Instead Basilian monks have built the Christian Sanctuary. The first document that proves its existence is dated 1131. The square in front of the sanctuary offers you a unique view of the entire territory of the Cilento National Park. Just below the square, you will find a steep rock. Try to throw a coin there and make your wish. Your adventure on the Silent Way is about to end. Still sixty kilometers to go before leaving Cilento and its people. The last stage is also known as the artists stage: from music to visual arts, nothing will be left out to greet your passage on the Cilento National Park. Past Novi Velia you will move in the direction of Cannalonga. 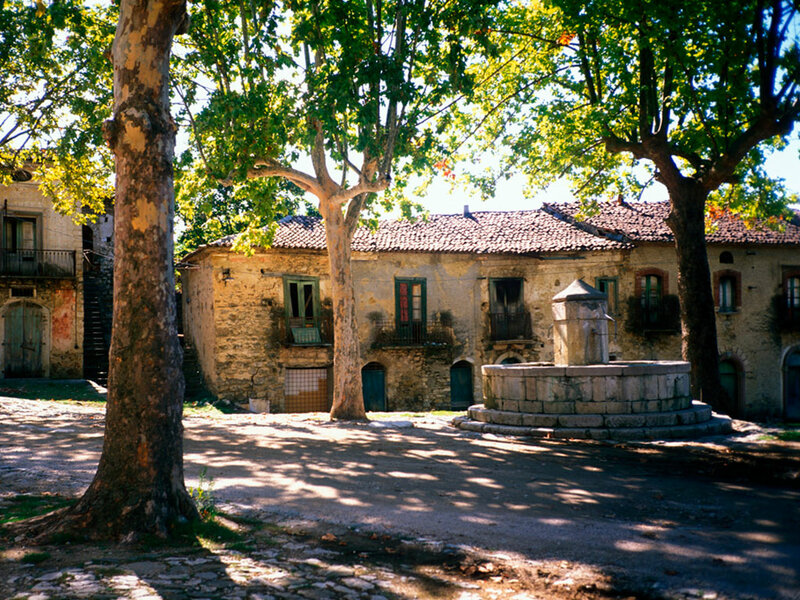 Moio della Civitella, a few kilometers from Cannalonga, is home of the event Mojoca. 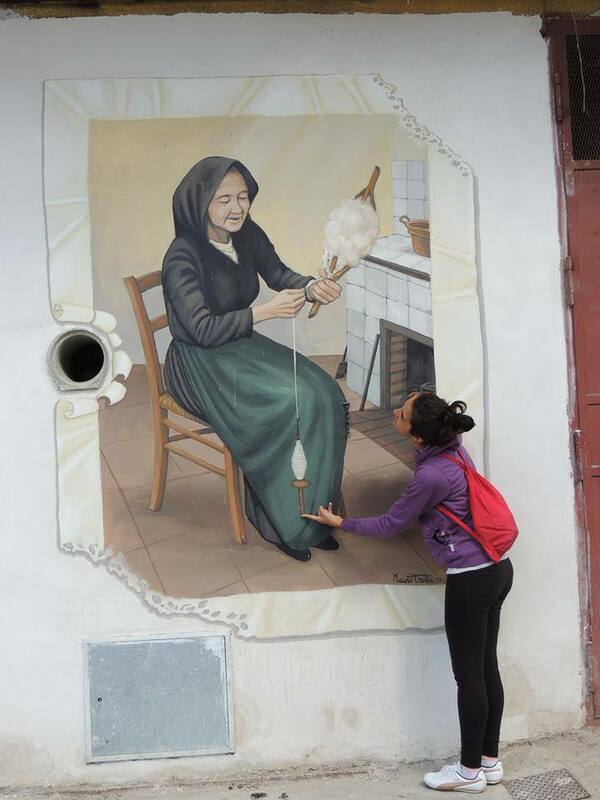 Every year, in early August, the town is transformed into a huge stage by calling through its narrow streets and small town squares, street artists from all over Italy. Immediately after Moio, you’ll reach the village of Pellare, which houses the Museum of Rural Life of Cilento and the laboratory of the great artist sculptor Emanuele Stifano. Go to visit him, he will be happy to show you and talk about his work. From Pellare the route continues towards Gioi Cilento where another great artist, the painter Mario Romano, will be awaiting you in his house and museum, if you are lucky, he will take you on a visit to the ancient churches of the village. After Gioi, you reach Piano Vetrale, well known for its many murals and for being the birthplace of the greatest artists of the Cilento, Paolo De Matteis, esteemed painter, active mainly in Naples during baroque époque riding the seventeenth and eighteenth centuries. You leave the village through a nice downhill road to the valley below to Omignano Scalo. Crossing the village you will get to Vallo Scalo first and, at the last intersection, turning left to Castelnuovo Cilento. The castle tower that can be seen among the foliage of the forest is ready to give you the welcome back and end your extraordinary journey along the Silent Way! The tour ends after breakfast today. A private transfer can take you back to the train station, Naples or Salerno. A taxi transfer to other destinations can be arranged on request. N.B. It is possible to include extra nights in any of the accommodations en route. Descriptions for extra rides and sightseeing options will be provided !!! 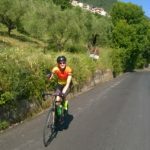 It is also possible to extend your tour with a few days in Salerno, or with a few days cycling along the beautiful Amalfi Coast. Details and prices on request. All nights are spent in beautiful, characteristic hotels, B&B’s and agriturismo’s (generally 3-star). All rooms have en-suite facilities. Dinners are included on some days. On other nights you are free to make your own dinner arrangements. On request all dinners can be included – at fine restaurants. Easy to Moderate (2-3): Mostly moderate rides but with some longer climbs. All roads are well paved and mainly quiet, with limited traffic except for some periods during summer and holidays near the coast. Extensions are possible on some days. Fitness: Some experience of bicycle touring and a good general physical condition will certainly make your travel experience more enjoyable. You should be able to cycle for several hours a day, even in hot weather. Arrival: The tour starts in CASALVELINO (MARINA), which can easily be reached by train from either Naples or Salerno. Naples has an international airport. From Rome (and many other cities) Naples and Salerno, and from here Vallo della Lucania, the nearby train station, can easily be reached. Departure: The tour ends after breakfast in CASALVELINO (MARINA). A short transfer can bring you to the train station, from where both Salerno and Naples are easily reachable. N.B. Luggage transport is NOT included in the above price. Available on request at a cost of € 110 per person (minimum 2 persons). Please contact us for terms & conditions. 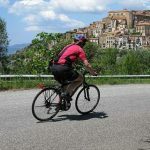 For really fit cyclists – and for those with road bikes – it is possible to add the two extra loops to the highest mountains of the Cilento: Monte Cervati and Monte Gelbison, staying one extra night in Sanza and Ceraso respectively. Shorter versions of the ‘Via Silente’ are offered as well. Check out the great 6-day version, which covers the beautiful first part, the ‘western’ Cilento. 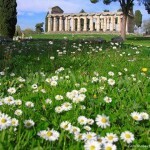 It is possible to extend your tour with a few days in Paestum, Salerno, along the beautiful Amalfi Coast or in Naples. Details and prices on request. Extra cycling and/or sightseeing options can be provided! 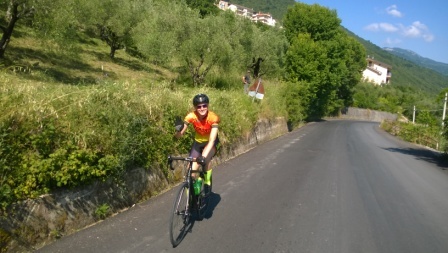 For fit cyclists – preferably with road bikes – it is possible to do the full ‘Via Silente’, including the two extra loops to Mt. Cervati and Mt. Gelbison, in less than 14 days. You can choose your own challenge, according to your fitness & time, and complete the full loop in 5 ,6, 8 or 10 days. Please contact us for detailed proposals. Luggage transport will be proveided, and for small groups also vehicle support can be organised. Details & prices on request.